Cafe 24 is a gorgeous 24-hour multi-cuisine restaurant inside Della Adventure & Resort in Lonavala and here’s why it is worth a trip (and your money). 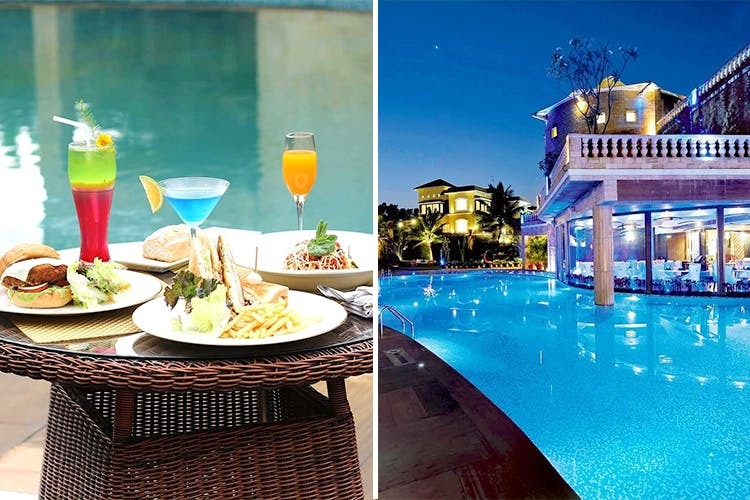 With its luxurious interiors and spectacular pool views, Cafe 24 is one of the classiest hangout places in Lonavala and perhaps, the only round-the-clock restaurant in the area. The dining space is done up tastefully with plush beige furniture that matches the ceiling and the hanging lights. There is a bar on one end which is well-stocked with a variety of international and homegrown spirits. Right beside that, is a swanky wooden cabinet that stores wines of all kinds and age. The food menu at Cafe 24 is vast and has an eclectic mix of cuisines featuring everything from quick bar bites to scrumptious main courses and delish desserts. We particularly loved The Della Tower, which is a belly-filling sandwich made of whole wheat bread, barbecued char-grilled chicken, garlic roasted shrimps and fried eggs. While the sandwich is a great idea for a quick snack, if you’re visiting the place for dinner, we recommend you go for a traditional four-course meal. For starters, the dish that won us over was the celebrity shrooms – crispy mushrooms tossed in peanut butter, cilantro and chilli glaze. You can also order their classy Cornish crab cakes served with minted chilli dip. Since we are big fish people, we ordered the lobster and asparagus casserole for the main course. The lobster was brilliantly cooked in white wine and jalapeno cheddar sauce and comprises the goodness of asparagus spears, carrots and sugar snap peas. Vegetarians, we hear their three mushroom and saltwater feta quiche is highly recommended. We concluded our meal with the extremely decadent fennel scented creme brulee served with glazed plum marmalade. Cafe 24 also has a special selection of Oriental desserts that include our favourite star anise infused lychees with gourmet French bean vanilla. Cafe 24 is known for its handpicked collection of sophisticated liqueurs including Sambuca, Cointreau, Tia Maria, Creme De Cassis, Creme De Menthe and more. Besides these, their cocktails are something that you shouldn’t miss at all. Our recommendation would be the incredible Bora Bora, a thoroughly shaken blend of white rum and Grand Marnier with pineapple juice, a tinge of lemon and dark rum.